A plane made a dangerous ice-landing near the North Pole on Tuesday to rescue a stranded British explorer who had spent a week camped on a drifting ice floe with his rations running low. Pen Hadow, 41, was picked up after the plane landed on a makeshift runway he had marked out on the floating ice using plastic bags. 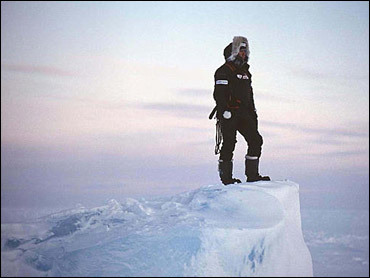 Hadow began his 480-mile trek on March 17 from Ward Hunt Island and on May 19 became the first person to reach the North Pole alone and unaided from Canada. Two earlier attempts to retrieve him failed because of breaking ice and thick clouds. Steve Penikett, a spokesman for Kenn Borek Airlines, said the ice was moving rapidly and continually breaking up, making the rescue mission difficult for everyone involved. "I wish it hadn't taken place at this time of year. This is the latest we have ever done a pickup," he told Sky News. "It's not the issue of him running out of food," he said. "It's the issue of going to the pole at this time of year is just a bit stupid and you are putting a lot of people's lives at risk doing it." But Penikett praised Hadow's achievement. "He has had quite a trek and I'm sure he's very tired and hungry. But he's done well," Penikett said. "Many people have tried this with varying degree of success. Anyone who gets there has achieved a good thing." Hadow was headed back to the team base camp at Eureka Weather Station on Ellesmere Island, off Canada's coast. He is then expected to return to Britain. A statement on the exploration team's official Web site said, "Pen is fine apart from obviously being tired and hungry and in need of a shower." His wife, Mary, who spoke to her husband on a satellite phone that was dropped off by the plane, also said he was in good spirits. "He was very cheerful and I think this week has been quite fortuitous in that he has had time to have a jolly good think and a jolly good rest. Physically I think he is pretty tired," she said from her home in Dartmoor, southwest England. Hadow has been on half rations of nuts, chocolate and dried fruit since Thursday, living in the tent in temperatures of about 21 degrees. The battery on his satellite telephone died on Friday, leaving the explorer with only a signal beacon - which he changed to indicate weather conditions - as a means of contact. His team said he called for a resupply of his food rations, also by changing the beacon, on Monday. Pilots decided they would take out the supplies but attempt to pick him up if possible. The rescue plane had to land about 30 miles away from Hadow until better weather permitted it to come in to about half a mile from the explorer. Queen Elizabeth II was among those to send a telegram when he reached the pole, praising his "courage, perseverance and determination." "You have defied great odds and extreme conditions in your endeavor," the queen said in the message sent to Hadow's family. "I offer you my warm congratulations."